I was educated in England as an accountant and then went into business in London. My cousin Stanley Kalms – who is now Lord Kalms – got me a job as the finance director at Dixons which had been founded by his father. At the time, it was still a private company but I took it public, and it has since become one of the largest consumer electronics retailers in Europe. Around that same time in the early 1960s, Rabbi Faivish Vogel came to London as the Rebbe’s emissary. He saw an advertisement that I had put in The Jewish Chronicle, announcing the birth of my third daughter, Penina, and he contacted me. 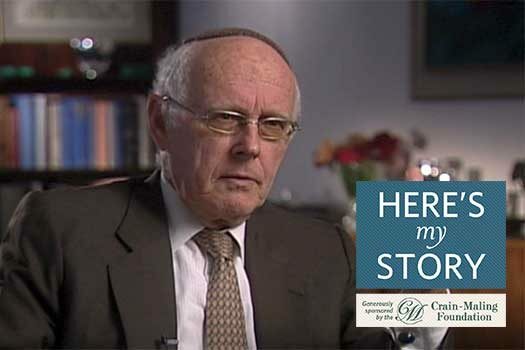 We became quite friendly, and as a financial manager, I helped him set up the Chabad infrastructure in England. As a result of our association, I grew close to Chabad and three of my youngest daughters were enrolled in Chabad schools and eventually married Chabad boys, two of whom are emissaries out in the world. Obviously, Rabbi Vogel talked to me about the Rebbe all the time, and he was very keen that I should meet him. “Faivish,” I said, “I believe that the Rebbe is a great man. 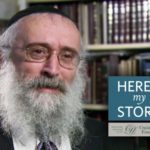 But I have no problems financially or personally, so I have no need to take up the Rebbe’s time.” To which he responded, “Do it as a favor to me.” So I did. 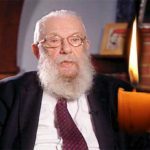 During my first audience in 1965, the Rebbe and I spoke mostly about what Rabbi Vogel was doing and what was involved in setting up Chabad of England. And then the Rebbe made a very interesting observation; he reminded me of a very basic accounting requirement of balancing the books: that the right side of the ledger must balance the left side, and so it should be in one’s life. Yes, there should be commercial or secular activity, but the Jewish activity of learning and awareness should balance that and be equal to it. He also mentioned that among the 613 mitzvot of the Torah, there are small ones and large ones, but all have to be kept if you want the account to be right. When I was leaving, the Rebbe said, “Is this alright for the first meeting?” which was such a sweet way to end the audience. He then blessed me and my family, and I walked out inspired. Immediately I sat down to record in writing everything he said, so I would remember it exactly. It was obviously a very special meeting and the Rebbe was like no person I had ever encountered before. In later years, I’d met Margaret Thatcher and Lord Rothschild and others, but the Rebbe was clearly on a different level. In 1969, I went back for a second audience. On this occasion I was reporting to the Rebbe on the financial aspects of the Chabad organization in England. When he heard me out, the Rebbe said, “You should be more aggressive in your fund-raising efforts. You are too cautious.” I guess I was too English, too polite, and I was not getting it across to people that this cause should be a priority for them. The third audience, in 1971, was a traumatic event. I came, together with my wife, to get his blessing on my plan to make aliyah to Israel. I had already, after much trouble and negotiation, acquired a beautiful property overlooking the Old City of Jerusalem, fully believing that the right thing for us to do was to go to Israel, to contribute to Jewish life there. I had also made other arrangements – I had found a very good deputy to take over my duties at Dixons and had spent years training him. It was all set. My wife was not as keen as I was, but she went along with my opinion that this was the best thing for our family. 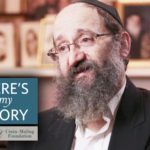 And then I saw a different side of the Rebbe – the strong, unsmiling side. He said, “In every way, this would be the wrong thing for you to do. You’re not a politician, and Israel is basically governed by politicians. So over there, your influence and your capability of accomplishing things would diminish from day to day. But you have an important role where you are.” His very clear message was, “Stay where you belong. Don’t go.” His point was that I was fortunate to find myself in a place where I had power to do good, and it would be a dereliction of duty for me to abandon my mission. He gave me the example of Yaakov Herzog who was the director-general secretary of the Israeli prime minister’s office at the time, and who had been offered the position of the chief rabbi. And he asked me, “Where would he have more influence?” The answer was obvious – he had more power to influence Jewish life in Israel by staying in politics rather than by holding the titular office of the chief rabbi. My situation was parallel to his, the Rebbe said. I was in a fortuitous position to influence Jewish life in England, plus I had certain abilities, all of which was part of G-d’s package for me, so to speak. This is where I could contribute the most, not in Israel. I was not happy with what he said, and afterwards, I wrote a long refutation, pointing out other issues the Rebbe had not addressed. By the next morning, there was a response from the Rebbe. He wrote, “Another important reason (which I did not mention since your wife was present) is that each and every one of us has been mobilized by Divine Providence to wage the battle for Yiddishkeit in a specific place, and it’s not for a military man to forsake his post, and all the military personnel around him and the cities on the scene which he is to defend, because he has found (in his opinion) another place where the battle is easier. Especially if he is an officer over fifties, or an officer over hundreds of thousands. This is simple to understand.” He also went on at greater length about how what I was planning was absolutely the wrong thing to do. Mr. Peter Kalms is a businessman from London England who has written a book, Guidance from the Rebbe, about his many audiences with the Rebbe. He was interviewed in August of 2007.